MIKE WOMACK, 38, from Lymm is taking part in Manchester’s Big Fun Run at Heaton Park this Sunday, alongside approximately 100 friends & family in memory of his wife, Sophie, who sadly passed away after a brave battle with cancer. Sophie was just 33 when she passed away after fighting cancer for almost two years. Sophie and Mike had been together for about 10 years and got married in July last year in the Lake District on the edge of Ullswater. Although they both knew the probable long term outcome, they were both determined to make it the best day ever. 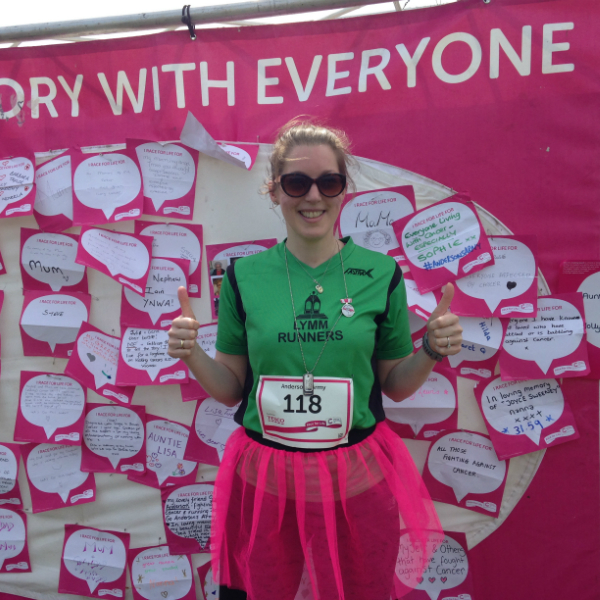 Sophie ran a 5k race for life event in spring last year (Sophie’s maiden name was Anderson) with many of the Lymm runners and “Anderson’s Army” was born. After Sophie’s passing, the team of Anderson’s Army decided to do something positive to remember her and raise some money for charity at the same time. Sophie was a great runner and member of her local running club where she lived in Lymm. There will also be friends & family participating from afar, who can’t make it along to the Big Fun Run itself. “There will be friends and family who can’t join us on the day but have set themselves the challenge of running / walking a 5k wherever they are. From Sophie’s sister, Vicky, running 5k in Hong Kong, to Sophie’s Aunt and uncle walking 5k in Skipness in Western Scotland to family friends walking the 5k in Australia.” Mike said. Sophie previously raised money for both Beating Bowel Cancer and The Christie. Anderson’s Army are well underway for raising money for both charities at the event. Big Fun Run Manchester takes place on Sunday 20th August at 11am, and promises a fun, relaxed atmosphere which is the perfect challenge to set yourself in 2017. To find out more, visit www.bigfunrun.com.